This section explains who is responsible for fixing leaks in and around your home and what help we can offer. Water leaks are a waste of a precious resource and may cause damage to your property. The cost of putting right long-term damage is always far greater than dealing with a leak promptly. We own and maintain the water mains which carry water to homes and businesses. 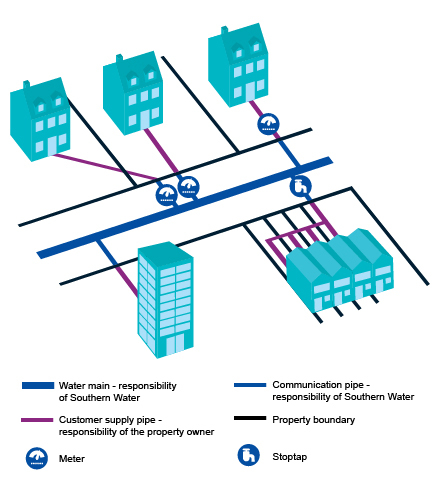 Your home is linked to the water main by a service pipe. Not all supply pipe configurations are this simple. They may run under outbuildings, to the back of your property, over third party land before reaching your property or you may share a supply with your neighbours. The following diagram shows a few different examples. We recommend checking your insurance policy to see if you are covered for internal and external leaks on your pipe work. There are specialist policies available. How do I know there is a leak? Visible signs of a leak include water bubbling out of the ground or a very damp patch in your garden on a dry day. 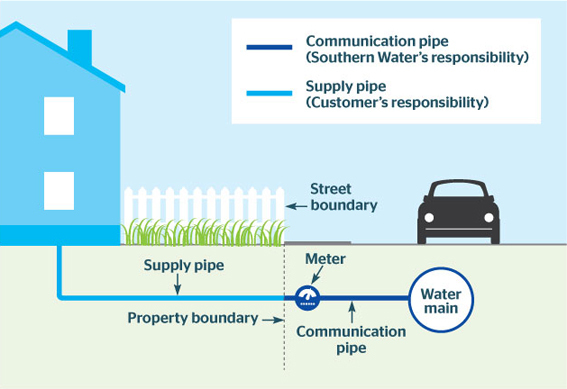 If your water supply is metered you can carry out a simple check by taking meter readings. Where is the meter fitted? Most meters are found in the public footpath outside your house or in the front garden. They are located in an underground box which is usually under a metal or plastic cover. Sometimes it will be covered with a large cast iron cover, which you should not lift. Occasionally meters are located inside the house next to the stop tap, which is often under the kitchen sink. Finding a leak – Where water is not obviously leaking above the ground, we offer up to one hour’s free leak detection work. Our equipment is very effective but we cannot guarantee to find the source of the leak. We will ensure that we tell you the results of our detection work. Repairing a leak – we recommend you contract a reputable plumber or ground worker to make repairs. Using a WRAS approved plumber means you can be assured a standard of workmanship and materials. If you decide to undertake repairs yourself we can offer advice on types of fittings and where to source them, more information is available here. We will offer assistance for customers who are on our social tariffs, on our special needs register or on certain means tested benefits. The exact help will be determined by the length and position of the supply pipe, please call us on 0330 303 0277. Will my metered bill be corrected? If you are paying metered charges, we will correct both water supply and wastewater charges to reflect the extra amount of water recorded because of the leak once it has been repaired. We normally re-calculate your metered charges based on your past water use. Where there is no record of your previous water use, the adjustment will be based on the average use of a property of a similar type. Charges will be adjusted back to the previous bill for metered customers. For customers who have not previously received a bill then the re-calculated charges will be back dated to the beginning of the financial year. You did not repair the leak within a reasonable period.